The term strategic design is getting more and more popular, but only a few know what it really is. In order to create a shared understanding, I designed a model which puts the core aspects of strategic design into perspective, and which presents my view on strategic design: a holistic approach to orchestrate components of complex systems in order to create value and impact. Strategic design has to focus on everything: the end-user, the product-/service-systemand the paying customer, each represented by circles. Their interaction (triangle) is key. 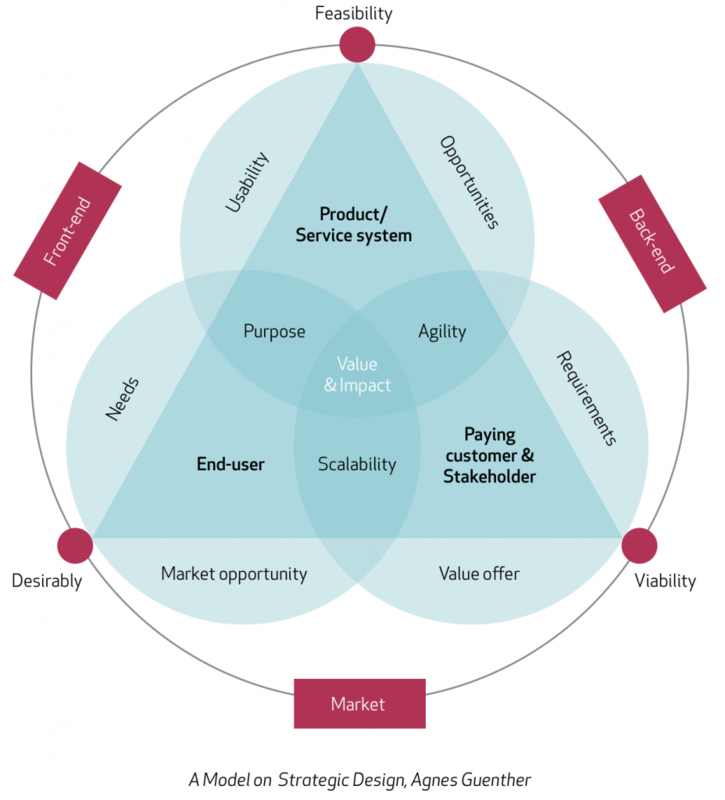 Whatever you create needs to be desirable to the end-user, feasible from a product/service perspective, and viable, meaning that your direct customer will pay for it. Your product/service creates new opportunities to your paying customer, however, it also need to match his/her requirements. This will mainly impact the backend of your designed system. With your product/service, your paying customer is able to offer a new value to his/her customer (the end-user). Changes in the market caused by technological or demographical developments create new user needs and in the same time new market opportunities. The user needs, in return, have also to be satisfied by your product/service. This influences your front-end of your system. Don’t stop here once you have everything aligned! It is time to have a look insight your own company and how it interacts with the parts – what is the purpose, how can you ensure to keep your agility, how scalable is the product-/service-system you designed? If all components of your system are well orchestrated, then you create real value and impact. …and that what I think strategic design is about. P.S. I don’t think the model is perfect yet, but it’s ready enough to get your feedback.